The name on our door is deceiving, but it comes with a funny story that only family owned businesses can have (and after more than 100 years in business, why change it?). 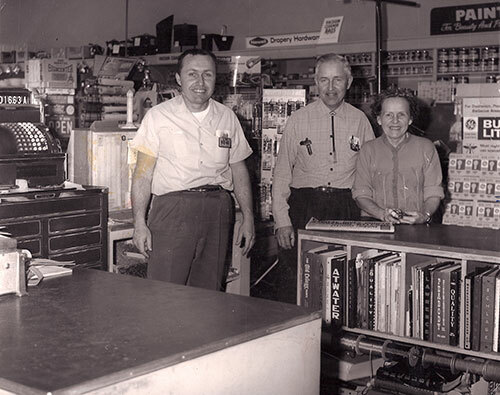 Berger Hardware has been owned by the Robertson family since it first opened in North Park in 1912. We’ve had customers coming to us since Hayden Sr. was running the show, followed by his sons Hayden Jr. and Richard, and grandsons Craig and Stuart. Some of those customers still visit the store today and ask after all of them. There has always been a Robertson in the building. So you might ask, why not Robertson Hardware? Well to be frank, Berger has a better ring to it. But in all seriousness and truth, when Great-Great Grandma Robertson moved to San Diego with Hayden Sr. and his baby sister in the early 1910’s freshly divorced, she, as you might expect, met a man. And as you might have guessed his name was Berger. It was a good old fashioned love story where they went into business together, she fronted the money and Mr. Berger provided his name and, well it about stopped there. Fortunately, the business had more stability than that of its namesake, surviving two world wars, the Great Depression, and every recession since. So stands the question: How? How does a family business survive over 100 years? How does it remain profitable and competitive with the Big Box Stores and internet retailers? How did it survive family conflict that, let’s face it, all family businesses have? Well it’s not for lack of stubbornness; but we believe the answer can be seen living and breathing in the culture of what it is to be American. We strive to build and to last, and when a fault line cracks we rebuild and endure. Berger Hardware is the oldest business in North Park, the 26th oldest business in San Diego. Our products have similar quality. We specialize in the things that hold everything together in our lives. What things? The things you don’t notice yet you couldn’t live without. Door locks, door hinges, cabinet pulls, kitchen and bathroom cabinetry. All little things that are essential to the function of everyday life. It’s that attention to the detail and quite a bit of experience under our belts that gives us the advantage.